Echoes T7E by Audiority is a Virtual Effect Audio Plugin. It functions as a VST Plugin, an Audio Units Plugin and an AAX Plugin. 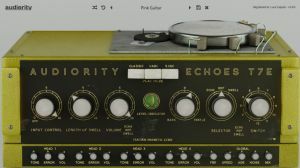 Echoes T7E is a faithful recreation of a vintage tube magnetic echo made in Italy in the early '60s featuring 6 ECC83 (12AX7) tubes providing a warm and unique sound. Since the main "core" of this effect is based on a spinning magnetic drum mechanism, we modeled both the mechanics and the electronics. Echoes T7E also provides 3 different playback modes allowing you to set different spinning speed or ever synchronize it to your host tempo extending the original delay length from ~310ms up to ~1100ms. Analog Modeled Vintge Tube Echo. 3 Playback Modes: Classic, Varispeed and Sync. 4 Playback Heads (equally spaced). EM81 "Magic Eye" Tube Level Indicator. 3 Echo Modes: Echo, Repeat and Swell. Tone, Error and Volume controls for each head. Magnetic Drum Age and Speed settings. Internal hum noise (for increased realism and self oscillation). All I can do is just "echo" what has already been said about this thing. It oozes vintage soul and you can easily lose yourself in it. Plenty of options to tweak your way back in time. Definitely not just another delay, it's almost human. Do you remember the astounding David Gilmour's guitar echoes in the very long track of the same name in the album "Meddle"? It was THIS echo unit! The Binson Echorec 7TE. It was also the echo unit used on all his albums by T-Rex. And this emulation made by Audiority is wonderful. It runs in the same league as Nomad Factory's 80s Space which emulates the famous Roland RE-201 echo unit. 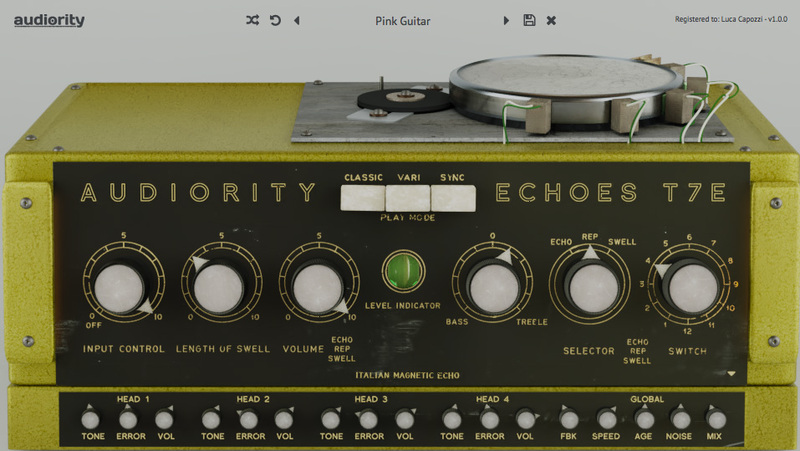 Both are probably the most accurate emulations of these two legendary vintage echo units. Bravo... love at first listen! Unique compared with other delays. Extended options give this plugin flexibility in a modern context as well. I'm very impressed with this thing. The most fun you'll ever have with a delay. Make any sound into Echoes T7E, get it looping, work in some AudioThing Outer Space (another nice RE-201) and throw on some Valhalla Shimmer and twiddle away.....for hours! An easy 5 stars. Audiority's reverb unit is also worth a test drive.